Summer (not The O.C character)... I miss you! Come soon! I also miss The O.C character. So glad we have Doctor Hart! Lovely outfit, I love your flower crown! And I agree, I want to wear some summer clothes! your outfit is so cool! love your lace blouse! Nice outfit! I really love your tights. Lovely outfit! I am loving your headband, it looks great! I love the flowers' crown! Loved your lace top..and the stockings are so cool! Cute look. 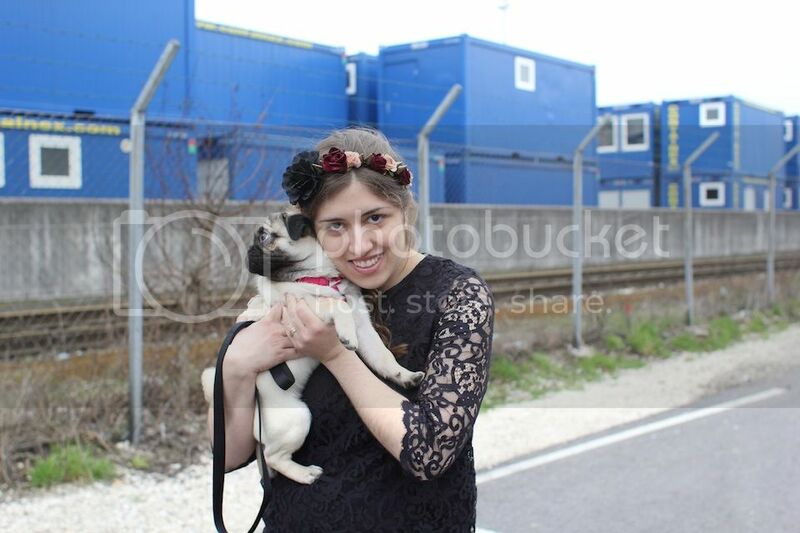 I really like the headband.=) And your little pug is so cute! Total black!!! Un éxito .... me.encanto!! Pretty look and great photos! love the all blk ensemble, you are so pretty- awesome and unique leggings too! xO! you look gorgeous, I love your tights, and your blazer! Love this look, especially the tights! Stunning! Loving total black outfits with interestin details! This flowery headband is amazing! Me encantan esas medias!! y la diadema de flores es para morir de amor. Me parece un look muy gotic chic jaja. Oh my goodness the dog is adorable!!!! Love the headband! I've been obsessed with big floral headbands lately! Cute dogs, cute outfit and hairband! You look so pretty in black! and the pug is so adorable! I want a little doggie too! And I love your outfit.. I wish I have somewhere to wear something like that! Such a unique tights! I love your headpiece, looks like someone transitioning to spring! Carefull - I might have to come borrow your pup! :) Too cute. Love the floral wreath! love the idea of putting some flowers in your hair. Very Spring inspired. great outfit!!! XD love the tights! cool leggings! it's so unique! Absolutely amazing!! Love your floral crown!!! love your outfit! especially the top! I loved the OC. your dog is so cute! the outfit its so cute! How adorable is your dog!!!!!! I love your outfit too!